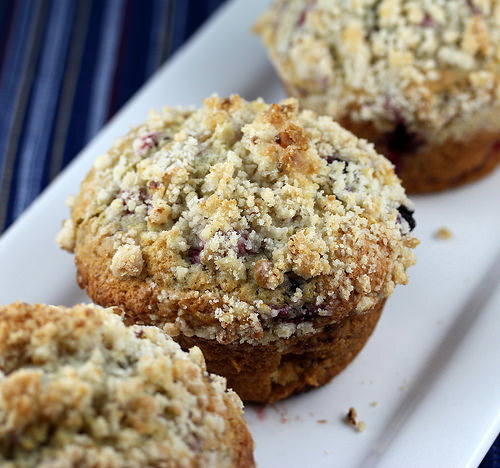 If you have fresh berries available give this Jumbo Blueberry Raspberry Muffins Recipe a try. Serve them warm with butter, and there’re delicious. I used fresh blueberries, and raspberries in this recipe, but I am sure any combination of berries would work out just as well. In a large bowl mix together the flour, sugar, baking powder, baking soda, salt, and cinnamon. In another bowl using an electric mixer, beat the eggs, and then mix in the melted butter, buttermilk, and lemon zest until well combined. Mix the egg mixture with the flour mixture until combined. (You want this to be just moistened – don’t over mix the batter will be lumpy.) Gently fold in the berries. 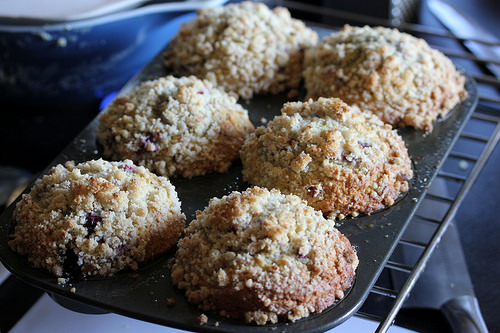 Lightly spray a jumbo muffin tin with cooking spray, and spoon the batter into the muffin cups. Sprinkle the topping evenly over the top of each muffin. Let cool 10 minutes, remove to cooling rack to cool, or serve warm with butter.